BEND, OR -- During the region’s first summer-like weekend, many flocked to Bend’s new whitewater park. One local family is now urging others to learn from their experience and keep little ones away from the rapids. Angie Neumaier and her husband went through the Passageway Channel on Sunday with their five kids, ages three through 12. Neumaier tells KBND News, "The three-year-old and I were in a double tube, my 10-year-old daughter was in a kayak and then the rest of them were in tubes. Our impression was that there were two passageways: one for people wanting more of an adventure and the other one was for everybody else to go down smoothly and easily- With some risks, obviously, but just something easy for everybody." But, she says they got more than they bargained for. "It ended up being a series of, I guess, around eight rapids. The first one threw my three-year old out, but I caught her by her leg, which obviously was really intense. Then, I was just holding on to her." 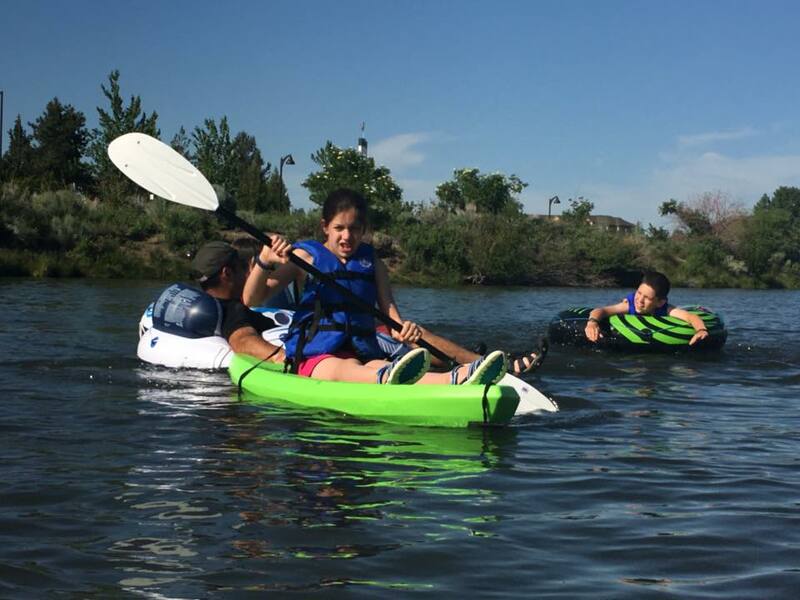 She says her kids are experienced at floating the river, and the family did not expect the class one and two rapids. Neumaier may have grabbed the toddler as she was tossed out of the tube, but her husband had to rescue their 10-year-old who took refuge on some rocks after she was thrown out of a kayak. "Once we got down and through the whole thing, he went back over to the rocks at the very end and walked up and got her. The boys both got tossed off a couple times. For them it was more a fun, exhilarating adventure. But, definitely scary for the little ones and for us, because we were totally caught off guard by it." Neumaier says more signs should be posted warning of the intensity of the rapids, even on the channel described as safe for floaters. "There's signage for that middle passage that says 'for experts only;' there was signage that said 'passageway rapids' and there were signs that said, 'Get off for portage.' But, there was nothing that said what, in my opinion, should say, 'class one, class two rapids ahead, not intended for children.' Any of that kind of thing; a 'proceed at your own risk.'" Bend Parks and Rec tells KBND News they are listening to feedback and may increase signage if they determine it's necessary. Click HERE to read more about the organization's response to concerns. After sharing her story on social media, she says she’s heard from a number of other parents who had similar experiences. She adds, "When I got home, I was looking at their website, and I think it’s totally misleading which, people who are used to floating the river don’t think that they need to go read instructions on the website, so I think that’s part of the issue right now. But, it says the passageway is class 1 and class 2 rapids, but it also talks about it being ok for floaters. And, I don’t think Bend floaters, in their little $10 tubes, are prepared for that." 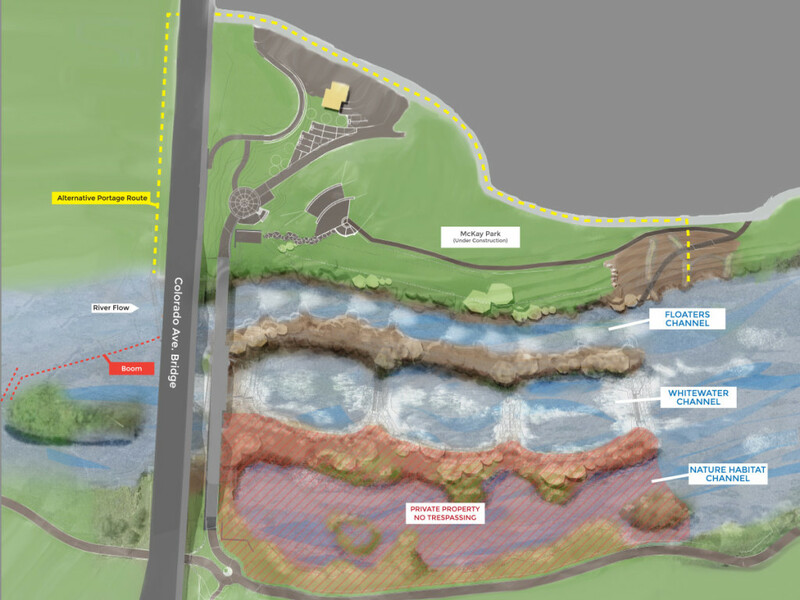 Graphic from the Bend Parks and Recreation District's website.